Welcome to the Utah monthly edition of Poetry Happens, brought to you by Rock Canyon Poets. Each edition will include poetry happenings and other announcements coming up in Utah, with highlights specifically for Utah county. And tune in on KRCL Radioactive the first Wednesday of every month for announcements and feature poet reading! 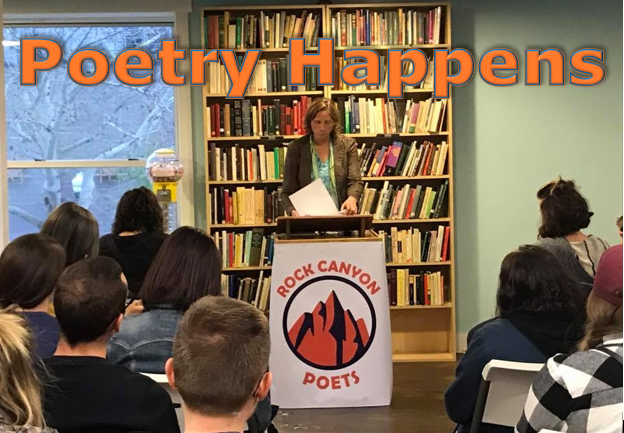 Rock Canyon Poets poetry reading & open mic every 2nd Tuesday at Pioneer Book in Provo, this month on April 9, 2019 from 6:30 – 8:00 pm featuring Fish Burton! 2nd Annual Provo Poetry Contest awards and open mic – Winners will be announced in April and will be featured at Speak For Yourself Open Mic on April 18th. Speak for Yourself Open Mic is a weekly creative writing open mic held at Enliten Cafe (43 E Center Street, Provo) Thursday nights. Sign up starts at 7 pm and the readings start around 7:30 pm (come early to grab a table and your favorite slot on the list of readers). City Art Reading Series, typically first three Wednesdays of every month during the school year at 7 PM at the Salt Lake City Downtown Library. Check their Facebook page for event announcements. This month on 4/10 Richard Robbins and Rob Carney! Sugar Slam, every 2nd Thursday at Watchtower Cafe in SLC at 8 PM. Helicon West open mic for poets and writers, the 2nd and 4th Thursdays of every month: Thursday, March 14 & 28, from 7 – 9 PM at Logan Library. Salt City Slam – last Monday of every month at 8:00 pm at Vertical Diner in Salt Lake City. NaPoWriMo (National Poetry Writing Month) – April is National Poetry Month! Join the CWC for a workshop series that celebrates poetry in all its glory! We’ll explore various genres of poetry, learn to compose poems, and practice revising and sharing our work. Saturdays, April 6 – 27 from 1pm – 3pm. SLCC Community Writing Center, 210 East 400 South, Salt Lake City. Poetry Workshops – In celebration of the Sor Juana Prize for poetry and prose in Spanish. Artes de Mexico en Utah presents a series of three poetry workshops in Spanish. Apr 9, 2019 at 06:00 pm – 08:00 pm (Tue), Community Writing Center, Library Square, 200 East 400 South, Salt Lake City. Poetry Month Poetry Walk – Celebrate this unique literary art with a stroll through the Garden to find eleven poetry boxes featuring poems written by winners of our Spring Poetry Contest. Apr 11, 2019 at 09:00 am – 07:00 pm (Thu), Red Butte Garden, 300 Wakara Way, Salt Lake City. READ LOCAL Onsite: Featuring Trish Hopkinson & Jennifer Tonge – A collaboration between Salt Lake City Arts Council and 15 Bytes with support from Utah Humanities, READ LOCAL Onsite pairs emerging local writers with established writers for a reading and discussion of their work. Thursday, April 11, 2019 at 7 PM – 8:30 PM, Finch Lane Gallery, 54 Finch Lane, Salt Lake City. 2019 UTSPS April Awards Festival – UTSPS will hold our 2019 April Awards Festival on Friday & Saturday April 12-13 at the Provo Courtyard by Marriott, 1600 N. Freedom Blvd (200 W), Provo, UT 84604. The festival will start in the late afternoon on Friday and conclude late afternoon on Saturday. The keynote speaker and workshop leader will be Aaron Abeyta, professor of English at Adams State University in Alamosa, Colorado. Download and print the Spring Festival registration form. LEAP into Science and Poetry – Parents and children ages 5-12, to help kids understand how to think like poets and scientists. Wednesday, April 17, 2019 – 4:00pm to 5:00pm, Foothill Library Branch, 1135 S 2100 E, Salt Lake City. Native Sustenance poetry reading – Cynthia Wilson, Traditional Foods Program Expert from Utah Diné Bikéyah, Orlando White, Poet and Professor at Diné College, and Lisbeth Louderback, NHMU’s Curator of Archaeology. No ticket necessary. Open to the public. Thursday, April 18, 2019 – 7:00pm, Marmalade Branch Library | 280 W 500 N, Salt Lake City. Cowboy Poetry Week – Cowboy poetry and music with Jo Lynne Kirkwood, Greg Harwood, and Kenny Hall Open to all 7:00 pm April 21 – 27, North Sevier High School Library, 350 W 400 N. Salina, Utah. SLC Poetry Slam Finals feat. Desiree Dallagiacomo – The best performance poets in Salt Lake compete for a spot on the Salt City Slam team, which took 4th in the nation at last year’s National Poetry Slam. Apr 22, 2019 at 07:00 pm (Mon), Athena Coffee & Bistro, 111 West 9000 South, Sandy. Osher Poetry Reading: Rob Carney – “Poems from 88 Maps and The Book of Sharks” You’ll hear about oceans and firestorms, sharks and coyotes, an entomologist, and a man who grows Bird Trees. Mon Apr 22 2019 at 01:00 pm to 02:00 pm, Commanders House, 1965 Detrobriand St, Salt Lake City. Reading by Adam Tavel & Debut of Westminster’s Literary Magazine, ellipsis… literature and art – Free readings begin at 7:00 pm in the Kim Adamson Alumni House at Westminster College and are followed by book signings and receptions. Apr 26, 2019 at 07:00 pm (Fri), Kim Adamson Alumni House – Westminster College, 1840 S 1300 E, Salt Lake City. 1840 South 1300 East, Salt Lake City, Utah. To register, email cc0709@westminstercollege.edu by April 17. The Poetry of Field Journals Workshop Series – Natural History Museum of Utah invites you to discover the beauty and poetry of field journals in this four-part series. Guests must register for all four programs. All materials included. Participants must be at least 18 years old. Space is limited. Saturdays April 27 – May 18, 10am – 12pm. Provo Poetry POEMBALL Machine – Send in up to 10 short poems to be included in the POEMBALL Machines in Provo and SLC. 2019 Agha Shahid Ali Poetry Prize – Honoring the memory of a celebrated poet and a beloved teacher, the Agha Shahid Ali Prize in Poetry is awarded annually and is sponsored by The University of Utah Press and The University of Utah Department of English. $1,000 Cash Prize and Publication; Reading in The University of Utah’s Guest Writers Series. Deadline for manuscripts 48 – 100 pages is April 15, 2019. Quarterly West – open for submissions until April 30, 2019. Utah Life Magazine – The theme for the July/August 2019 issue is “Independence,” and the deadline is May 1, 2019. 7th Annual Sor Juana Prize for Poems and Short Stories in Spanish – $100 in cash prizes will be awarded for two poems and two short stories written in Spanish in two categories (8 prizes in total). Deadline is May 20, 2019. If you have an event or announcement related to poetry in Utah, please contact us here and we will include it in our next edition.